From the Confederacy’s first call to arms, to the Appomattox surrender, Robert E. Lee forged his reputation as perhaps the most daring soldier in American history, renowned for his shrewdness, courage, and audacity. 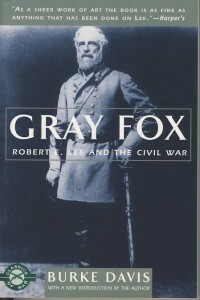 Gray Fox is the vivid chronicle of Lee’s command, a book that humanizes this gentleman-solder of tradition and makes him all the more awe-inspiring. The late Burke Davis is also the author of To Appomattox and other books on the Civil War.